Home Knife Collecting Do You Know Your Knife Terminology? Do You Know Your Knife Terminology? Do you know your knife terminology? Yes, I agree that it probably doesn’t matter much if you do or not as long as you’re into knives and love to use them, collect them and otherwise celebrate your favorite sharp tool. On the other hand, there’s a certain satisfaction in knowing your knife terminology. In other words, it’s nice to be secure in the knowledge that your understanding of knife speak is current and that you can hold your own in conversation with knife aficionados. Of course gentical is a newer entry in knife speak. There are others, some of which go back years, even decades. For instance, Cutlery Hall-Of-Famer Bob Loveless is famous for a hunting knife that many call a drop-point hunter or simply a drop point. However, drop point is a misnomer—at least it is in regard to the name Loveless originally gave the design, which was dropped hunter. Both drop point and dropped refer to the point of the blade in the design, which drops or rests below the midpoint of the blade’s plane. Somewhere along the line someone called it a drop point instead of a dropped hunter and the name stuck. In my opinion, drop point is more descriptive of the blade design than dropped—besides, dropped hunter sounds like a knife you dropped and/or lost in the woods somewhere. But I digress. Then there’s finger choil. Finger guard is another one. The word finger in either is superfluous—in other words, it’s not needed. It’s a guard or it’s a choil, period. Finger groove or grooves is correct, but not finger guard or finger choil. The guard is the cross/double guard with two quillons and/or single guard with one quillon—quillon is another entry in knife speak covered below—at the juncture of blade and handle that keeps your fingers/hand from sliding forward onto the blade from the grip. New from BLADE! 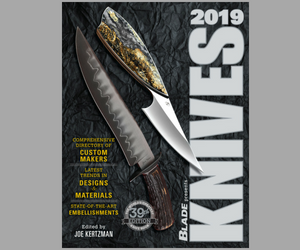 Check out the best articles on knife throwing, from the pages of BLADE magazine. A choil is a small cutout at the base of the edge of the blade. Cutlery Hall-Of-Famer A.G. Russell once said the choil’s original purpose was to indicate where to stop the stroke with the sharpener on the blade during the sharpening process. Some knives have larger cutouts at that juncture for placement of a finger for more detailed-type cuts. However, even then the cutouts are still choils, not finger choils. In addition, some companies and makers put a single groove in the handle just before the guard. Though they may call it a finger choil, it is really nothing more than a finger groove. Now, for the quillon. According to Websters, a quillon is “either of two transverse projecting members forming the cross guard of the sword.” In other words, a cross or double guard consists of two quillons and a single guard consists of one quillon. The cutlery community uses the term for knife guards as well. There are many knife terminology concepts you might want to know. I will cover them sometime in the future here at blademag.com.